The majority of us might remember the golf course as Bushwood Country Club, the sight of where ‘Caddyshack’ was filmed. But while Bushwood is a made up country club, the golf course that the film is based off of actually exists. Known as the Grande Oaks Golf Club, the Miami, Florida course hosted the 44th President of the United States this past week for 18 holes. 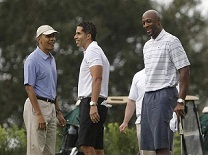 President Barack Obama paid homage to a classic movie, teeing it up with former Miami Heat star Alonzo Mourning. There was no Bill Murray, Chevy Chase, or Rodney Dangerfield out there on the golf course playing and keeping the grounds running, but President Obama was said to have had a great time playing the private Florida course with Mourning. The two were joined by Ron Kirk who is a U.S. Trade Representative, and Cyrus Walker who is a family member of Valerie Jarrett a senior presidential advisor. President Obama enjoys playing golf on the weekends, and tries to play as often as he can. He is a great spokesman for the sport, and has played golf with some of the top players in the world, including Tiger Woods. As far as what the President shot when he played this past weekend at Grande Oaks Golf Club we cannot say. But he has certainly improved over the last several years in his handicap. President Obama plays golf left-handed so perhaps he can get some tips from Phil Mickelson at some point down the line. The President did not stay in South Florida for very long. As a matter of fact he flew back to Washington shortly after the completion of his round of golf. He came to Miami following a stint in New Orleans where a speech on Infrastructure was given relating to exports in the United States according to ESPN.com. PGABettingOdds.com thinks that President Obama should add some other movie course to his to-play list. Perhaps the course from ‘The Legend of Bagger Vance’, ‘The Greatest Game Ever Played’, and the various courses used in ‘Tin Cup’. This entry was posted in News, Opinion and tagged alonzo mourning, grand oaks country club, president obama golf on November 11, 2013 by Bryan.